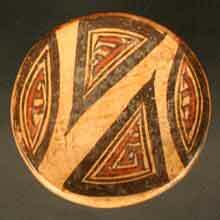 This culture emerged in what is now the Panamanian province of Coclé, near the Santa Marta River. The region is warm and humid, with clearly defined seasons. Its landscape includes valleys suitable for agriculture as well as rivers, and woodlands. It is populated by a wide variety of fauna including deer, jaguars, peccaries, coatis, armadillos, and reptiles such as snakes and tortoises, particularly near the coast. The Coclé were an agricultural people that complemented their diet with food they hunted and gathered nearby. They also practiced bartering, allowing them to obtain exotic goods and raw materials from other areas, such as copper and emeralds from Colombia. They found small nuggets of gold in riverbeds or in surface excavations in the nearby plains and mountains. They made alloys of copper and gold (tumbaga), sometimes adding a small amount of silver. They sometimes gilded the metal objects they made to increase its golden luster. They worked metals by hammering without heat, mainly making chest covers and helmets bearing a variety of decorations. They also practiced metal casting using the lost wax technique in order to make three-dimensional figures, and covered artifacts made of wood or bone with gold, silver or copper leaf. Bone – mainly of deer or peccary – was used to make figurines and flutes, and the decorations on these pieces depict other technologies they knew of, such as the atlatl or spear-thrower for hunting. 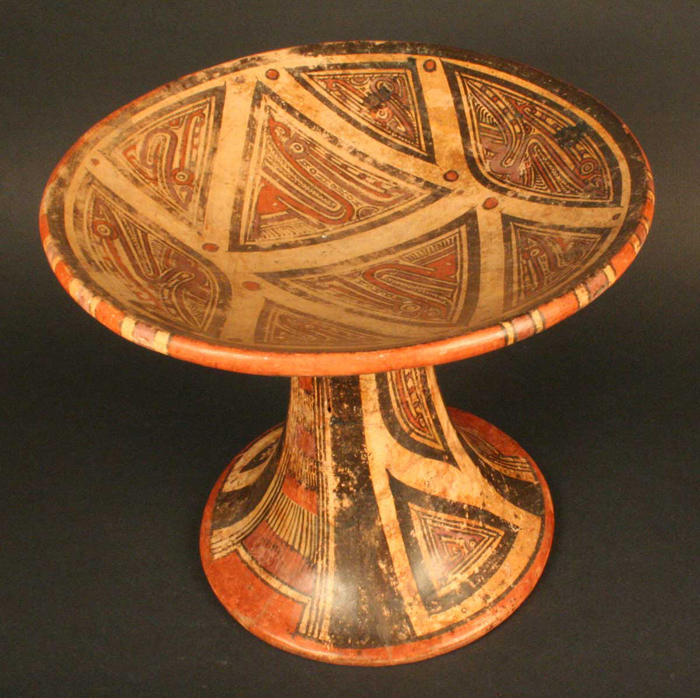 Coclé artwork is representative of Panamanian polychromatic styles, in which pigments are baked onto artifacts to give them a variety of colors such as white, black, brown, dark red, light red, and purple, sometimes all of them in a single piece. They painted zoomorphic and stylized designs onto their ceramic pieces, and their vessels included small bowls, elongated beakers, carafes, and plates with ring-shaped or pedestal bases. Some Coclé vessels are decorated with images of tortoises, birds, and snakes—sometimes snakes with feathers—while others include effigies with faces, humped backs, and masks. Other items found often include ceramic rattles. Another feature of Coclé decorative style is the use of black on white pigment, with motifs in the form of the letters Y, V, or T near the edges of vessels. In ceremonial pieces, these shapes are applied in red. 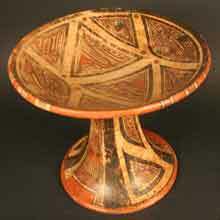 Another unique design in this ceramic tradition is the so-called Ala de Coclé, the Coclé Wing. At the site of El Caño, several columnar stone statues covered with zoomorphic designs have been found, as well as some with anthropomorphic designs in relief. The site has been interpreted as a temple, as it also features a central altar that is also decorated with zoomorphic forms. Other stone artifacts often ascribed to the Coclé culture include maize grinding stones carved with zoomorphic figures, generally feline and sometimes very large. These stones stand on four legs, and their finely worked craftsmanship suggests that they were not for domestic use. Some have been found with highly polished cylindrical grinding stones. Other grinders ascribed to the Coclé have zoomorphic motifs on their handles, made of semi-precious stones. These may have been used for grinding pigments or some other substance used in rituals. The Coclé people also made earrings from agate and serpentine, and they used rough quartz to make beads that were set in gold artifacts. Gold pieces associated with this culture show local styles and motifs related to regional chieftains. The Coclé culture was organized into groups led by chiefs or caciques, who came from a special bloodline. Their importance is reflected in the size of certain tombs, as well as in the type and quantity of grave goods in their tombs, and especially in the presence of totem animals such as the caiman in that array of artifacts. One of the most important Coclé sites is Conte, a cemetery used by this culture during its second phase of occupation. Some of the tombs at the site are unique, holding multiple bodies. Inside each of these lie the remains of a high ranking individual or chief accompanied by a large quantity of gold grave goods; with this person are two warriors, subordinate chiefs, or other individuals of rank, accompanied by gold plates; as well as up to eight servants or slaves, all adult males, accompanied with artifacts of lesser value. The accompanying individuals may have been sacrificed following the death of a leader, a practice that was observed by the Spanish who arrived in the region in the 16th Century. Some Spanish chronicles report that when a cacique died, his servants and family members would go with him to the grave, along with any of his wives who wished to do so. No direct evidence exists of the homes or settlements occupied by this culture, although Spanish chronicles describe temples and ceremonial centers that have since disappeared. 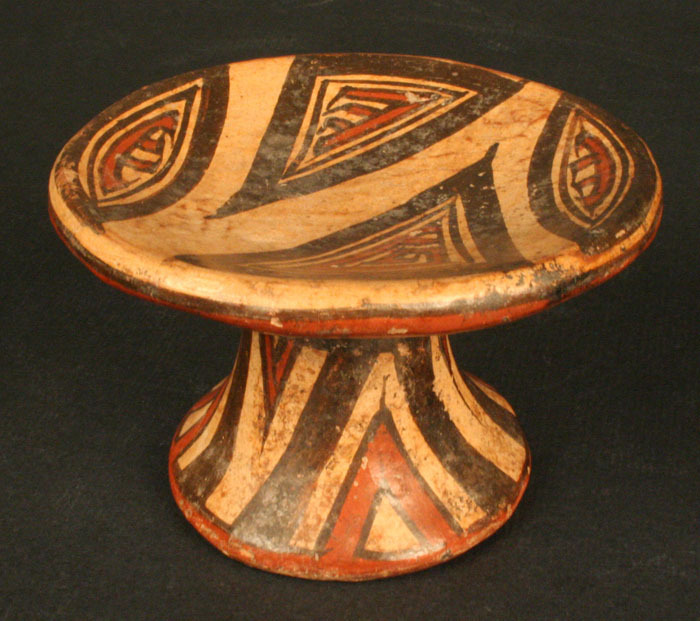 The influence of Coclé ceramics extended throughout most of the Panamanian isthmus, and took the form of spiral decorations and the colors typical of this tradition. Their gold artifacts reached as far as Chichén Itzá and other parts of Central and South America. Between 1515 and 1520, the Spanish fought with the chieftains of Panama over gold, destroying the social and political foundation of Coclé culture.